What if you do something “wrong” on social media? Don’t worry. Although some seem to believe there are ‘rules’ that everyone follows that isn’t really true. Even the experts can’t agree on something as simple as frequency. In an appearance on the Today show, Digital Lifestyle Expert Mario Armstrong believes in posting freely while Social Media Etiquette Expert Faye De Muyshondt insists we should only share on Facebook once a week! Don’t type in all caps because this is considered yelling online. Go easy on the updates. Try to share what others will find most interesting, entertaining or important. Don’t hijack someone else’s conversation. Be especially aware if they are competitors. Everyone loves images and videos; consider using them instead of all text. The Key to Social Media is Being Social! The biggest mistake most people make is using social networks as a way to broadcast their message or links. Listening is essential. We want to build relationships with real individuals by having conversations with them. Remember that the Internet is public and what you post online is forever, so be on your best behavior. Be true to yourself and reach out to others who have something in common with you and seem friendly. Another common mistake is sharing non-stop about you, you, you! Even if you’re a business, you don’t want to sound like a scratched DVD. People do business with people they know, share common interests with, and like. The point is not to post your products; the point is to get to know them so they are curious enough to look at your site. Don’t always be selling. Share humorous or entertaining images and videos. Comment on what they share. Re-share what they post. (People love to feel heard and appreciated!) You want to get their attention – not share your product catalog or continually be going on about yourself. The Google Plus users with the largest followings and the businesses with the most successful Facebook pages spend their time sharing only what they feel will go viral. Think about what your friends and followers would want to share and focus on that. Whenever we interact with other people there is the possibility that we may be disappointed. You may get unfriended or even blocked. We can’t please all the people all the time. The more active you are online the more likely you may annoy someone. Your style may not be what they like. That doesn’t mean you’re a bad person. If you post about controversial topics (religion, politics, non-traditional beliefs) close-minded people will take offense. It is up to you whether to stand for something or get along by never speaking up. Either one is perfectly fine. If we don’t stand for something we will fall for anything. It isn’t necessarily best to be the person everyone likes because you choose to always be agreeable. There is room in the world – and on social media – for all of us. The best way to learn any network is to set up your profile (add an Avatar, bio and a link to the best place to find you) and then listen in to see how others use it. If you need to be serious for business, do a search for that specific platform + strategy. You will find posts and videos that will help you. Then follow the author and see what they do. 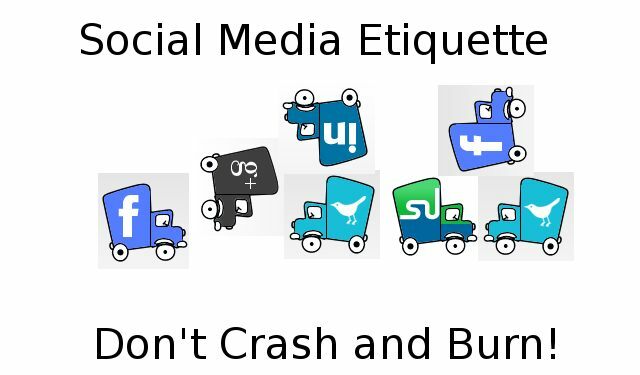 You can use Jennifer Mattern’s comprehensive list of Social Media Do’s and Don’ts to get started. Have questions? Ask us in the comments.